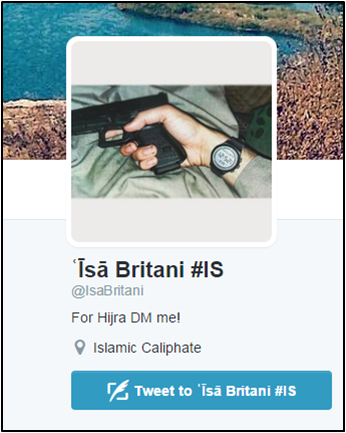 Isa Britani is an ISIS propagandist on Twitter who claims to live in ISIS-held territory. Britani has offered help to those interested in hijrah (migration) to the self-proclaimed caliphate.Isa Britani #IS, Twitter, accessed August 27, 2015, https://twitter.com/IsaBritani. He does not specify where he is from, but the Britani moniker indicates he is of British origin. 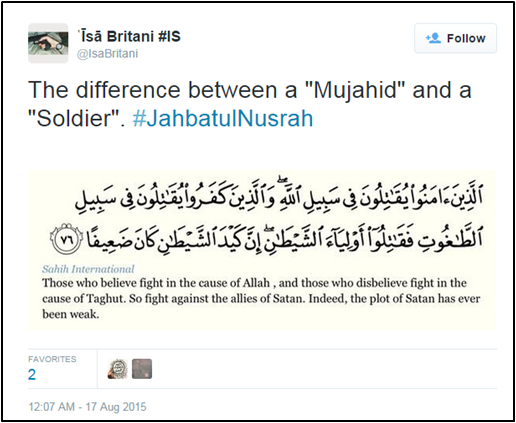 ʿĪsā Britani #IS, Twitter post, August 17, 2015, 6:04 a.m., https://twitter.com/IsaBritani/status/633217771074121728. 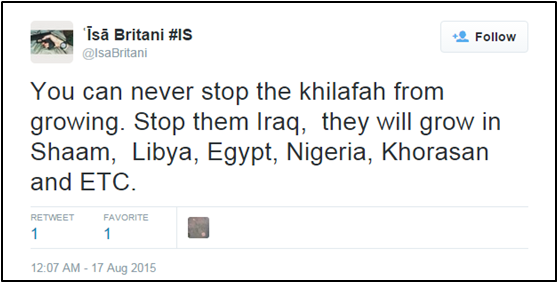 Britani has warned that “the khilafah” (caliphate) cannot be stopped. Isa Britani #IS, Twitter post, August 17, 2015, 3:07 a.m., https://twitter.com/IsaBritani/status/633173343399735296. He has praised the “mujahideen” (holy warriors) of ISIS and called for holocausts against the Kurdistan Workers’ Party (PKK) and the rawafid, or those who reject Islamic authority. 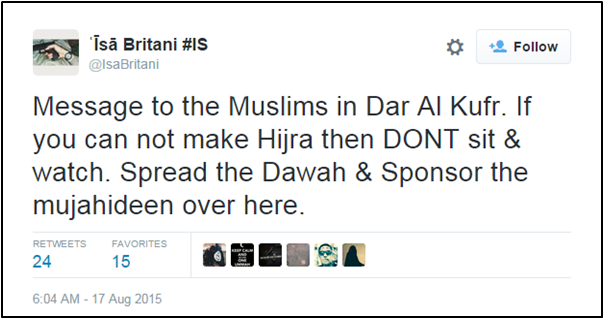 Isa Britani is an ISIS propagandist on Twitter who claims to live in ISIS-held territory. “Don’t forget your Brothers and Sisters over here. Make Dua for them and Sponsor them. #JihadWithWealth” (Tweet)Isa Britani #IS, Twitter post, August 17, 2015, 6:05 a.m., https://twitter.com/IsaBritani/status/633218064964788224. “Message to the Muslims in Dar Al Kufr [land of nonbelievers]. If you can not make Hijra then DONT sit & watch. Spread the Dawah & Sponsor the mujahideen over here.” (Tweet)Isa Britani #IS, Twitter post, August 17, 2015, 6:04 a.m., https://twitter.com/IsaBritani/status/633217771074121728. “You can never stop the khilafah from growing. Stop them Iraq, they will grow in Shaam, Libya, Egypt, Nigeria, Khorasan and ETC.” (Tweet)Isa Britani #IS, Twitter post, August 17, 2015, 3:07 a.m., https://twitter.com/IsaBritani/status/633173343399735296. “If Allah wills we will see 2 holocausts this year, a holocaust of PKK and a holocaust of Rawafid. Bithnillah.” (Tweet) Isa Britani #IS, Twitter post, August 15, 2015, 6:55 a.m., https://twitter.com/IsaBritani/status/632505906517921792. 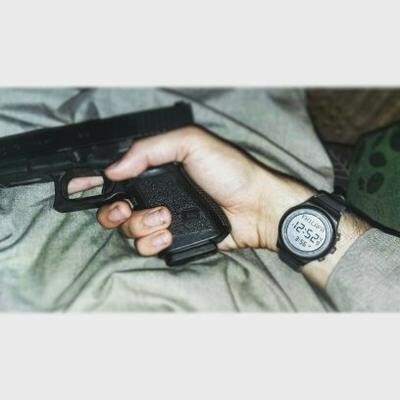 “For Hijra DM [direct message] me!” (Tweet)Isa Britani #IS, Twitter page, accessed August 27, 2015, https://twitter.com/IsaBritani.